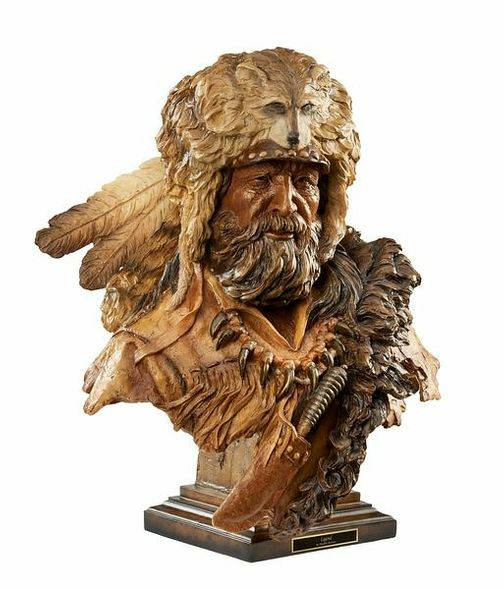 Stephen Herrero Millcreek Sculpture:"Legend – Mountain Man"
Sculpture Medium: Catalyzed White Alabaster / Porcelain Resins. These sculptures are the finest quality wildlife and western art reproductions available and are made from a combination of crushed alabaster stone, porcelain powders, and resin. Only the purest processes are used by Mill Creek Studios to reproduce the original impressions of the artist. About the Sculpture : Tales of adventure are based on rugged and "legendary" mountain men like this dramatic portrait in sculpture. Cold cast and hand painted. Name plate included.